I was scolded because I went into attack with each squadron. But it really was not because of excessive courage, but simply of ignorance, I thought, we must do this, and I was very surprised that the sergeant of another squadron, near which I was rushing like a whirlwind, shouted at me: "To hell with you here! Why do you ride here?" Having returned to my squadron, I wasn’t in my rankings, but traveled around: news spectacle attracted all my attention. Ferocious and majestic roar of gunfire, roar or some sort of rumble of flying shots, a galloping horse, gleaming bayonets of infantry, drums and firm step, and the calm appearance, with which of our infantry regiments attacked the enemy - all this filled me with feelings that I can’t express with any words”. And further: "... I saw a few people from enemy dragoons, who surrounded a Russian officer, knocked him with pistol shot from his horse. He fell down and they wanted to sabre him lying. At the same moment I raced towards them, holding my spear at the ready. Probably this foolish boldness frightened them, because in the same moment they left the officer and broke apart. Such a situation would have ended very disadvantageously to both, that is for the officer and for me, but, fortunately, a soldier from his regiment came to us and helped me put the wounded man on a horse. I told the soldier to send the horse to Konnopolsk regiment to someone Durov and trooper told me that the saved officer was Lieutenant Panin from Finland Dragoons regiment, and that my horse will be sent immediately”. This was the first battle of Durova. And then “cavalry-girl” made a mistake that discovered her “incognito”. From Active army she wrote a letter to her father, to appease him. Sarapulsky mayor outlined the essence of business Alexander I with a request to make his daughter come back. At the end of 1807 she was summoned to Vitebsk to the headquarters of Russian army chief General Buxhowden. He demanded to tell the truth about her origins. ”Cavalry-girl” admitted forgery. But surprised by this unexpected turn of events the emperor demanded Durova to St. Petersburg. She personally told Alexander I vicissitudes of her biography. In response, the Emperor bestowed her – the only woman in Russia – with George Cross. 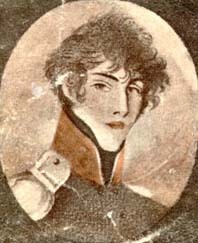 Durova considered that the most important reward was the permission from Alexander I to continue to serve in the army and be officially called in his honor as Alexander Alexandrov. After retirement in 1816 at the rank of lieutenant-captain, she demanded that the son Ivan called her Alexandrov.